On last week's FTMWeekly radio show, I announced that I would be supporting the Presidential candidacy of Rep. Ron Paul. Today, I want to list three reasons why I have chosen to support his candidacy. In the coming days and weeks, I will go into even more reasons why I am supporting Ron Paul. 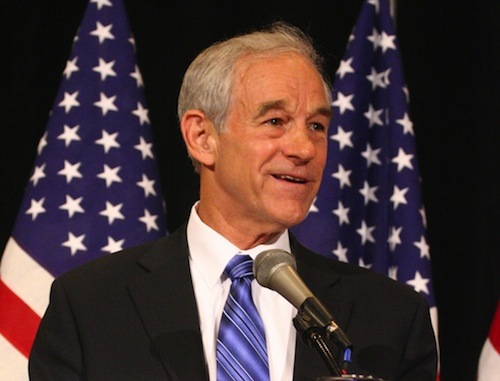 We begin with a look at Ron Paul's faith and foreign policy. Ron Paul is a born-again Christian believer. While that point is extremely important to me as fellow Christian, I greatly appreciate Ron Paul's long standing refusal to use his faith for political gain. Most Christian voters today are easily manipulated into voting for candidates who profess the Christian faith openly. Often, the actions of these candidates betray their "faith." On this point, I should add that my support for Paul due to his faith is not rooted in my desire for a theocracy. Far from it! I want government out of our lives, out of our bedrooms, and out of our churches, as does Ron Paul. It may comes as a surprise to you to learn that Ron Paul is the most pro-Israel Presidential candidate today. Paul's stance on Israel has often been misunderstood in the mainstream press and he is often accused of even being "anti-Israel" due to his stance on cutting foreign aid. In essence, foreign aid is taking money from American taxpayers and giving it to bloated bureaucrats in foreign lands. Those who spread this disinformation fail to realize that by cutting all foreign aid dollars, Paul seeks to help Israel. How? Did you know that Washington currently provides seven times more in foreign aid to Israel's sworn enemies than it does to Israel itself? In fact, two-thirds of U.S. foreign aid dollars that will be handed out in 2012 will be given outright to Muslim nations. If you are really a fan of Israel, you should ask yourself: "Why do those politicians who claim to be "pro-Israel" continue to give seven times more money to her enemies each and every year?" The truth is, if all foreign aid money handouts were cut, Israel would be a net beneficiary! Paul also rightly recognizes that by providing foreign aid to Israel, we are making them dependent upon us. Foreign aid creates an entitlement mentality within the recipient country. But even worse, this economic dependency has also allowed American politicians to interfere with Israel's right to self-determination. On a consistent basis, "Christian and pro-Israel" administrations have supported Israel's enemies with foreign aid while not allowing Israel to defend her own territory from those same enemies when necessary. For example, in 1981, when Israel attacked a nuclear reactor in Iraq, the U.S. Congress widely condemned Israel's actions. Not Ron Paul. He was one of the few Congressmen that dissented, claiming that America did not have the right to tell Israel, a sovereign nation, what to do when it came to their national defense. So, if you consider yourself a friend of Israel, you should ask yourself: "Why should I vote for "Christian and pro-Israel" candidates that ultimately prevent Israel from protecting herself?" Do you believe that Israel should be required to gain permission from the United States in order to defend her own territory? And do you support the United States funding Israel's enemies with seven times more foreign aid dollars on an annual basis? Instead, I agree with Ron Paul that Israel has a God-given right to self-determination. Israel has hundreds of nuclear weapons. Israel has the strongest military and the most prosperous economy in the region. By allowing Israel to function autonomously without our consistent political intervention, and our attempts to create a Jewish welfare state dependent upon our own bankrupt nation, we can become an even better friend of the Jewish state. Israel should be allowed to defend herself as she deems necessary. Israel should be loosed and freed to make her own political decisions apart from the schizophrenic intrusions by the United States. There is a difference between being against war and being against "unjust" wars. Ron Paul is often accused of being anti-war. The man is a veteran of the United States military and has consistently received more campaign donations from military workers than all the other Republican Presidential candidates… combined. As a strict Constitutionalist, and a Christian, Ron Paul believes that war is at times necessary, but should only be used as a last resort. War is an unfortunate side effect of mankind's fallen nature. Throughout the ages, those who have considered themselves to be Christian believers have struggled with the question of whether war can ever be justified morally. In the past, some Christians have turned to absolute pacifism, refusing to take up arms against their aggressors. Other Christians in the past have violently tortured and killed unbelievers in the name of God in a misguided effort to "cleanse" the world of sinners. Due to the sheer necessity of war at certain times, Christians eventually developed a way of dealing with the question of when to support military action with the adoption of the Just War theory. In essence, in order for a Christian to support a war, the cause must be just, all peaceful alternatives should have been exhausted, and can only be fought to redress a wrong suffered. This is just a sampling of the criteria which can be read here. So ask yourself: "Have the recent U.S.-led wars been considered "just" according to the Just War Theory?" Also: "Do you believe that the massive war profits made by the global elitists may have caused them to heavily promote military action as the only "solution" as often as possible?" And if you consider yourself a Christian, ask yourself: "Since when does a Biblical definition of supporting and praying for the peace of Israel require America to pre-emptively strike nations without just cause?" Also: "How exactly does a 'Christian' believer find theological support for a pre-emptive military strike when it is a clear violation of the 'just war' theory of Christianity?" I have long been a supporter of Ron Paul. However, as we head into the 2012 Presidential elections, I feel that we desperately need someone who truly understands what is going on in our global economy and who has integrity. That is why I am choosing to support Ron Paul for President in 2012. I will be writing more along these lines in the coming days and weeks. Ron Paul - 'Friend' of Israel?